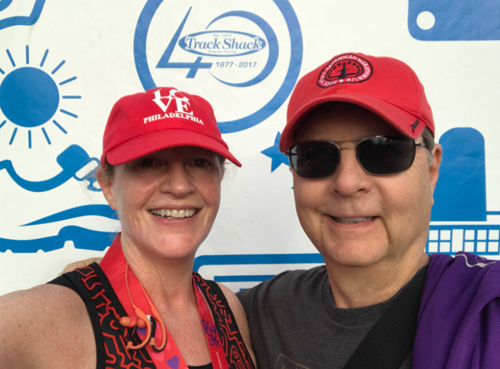 Track Shack - Fanatic Goals Spotlight: Suzanne D.
TS: After 167 races – Do you have a running goal? What is it? SD: My very first goal was a New Year’s resolution I set when I had only been running for a few months. I needed motivation to keep running – experts say it takes a year to establish a new positive habit. 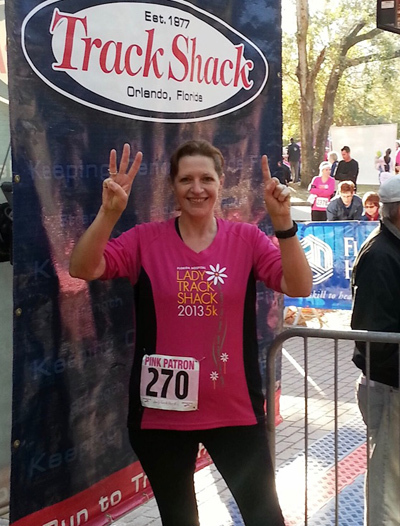 So I challenged myself to participate in three 5ks in 2013. It seemed like a lot at the time, but by the end of that year, I had completed 13 races including my first half marathon, the OUC Half. In 2015, I decided to sign up for a marathon. I trained for months ahead of time, using the Galloway run-walk method, aiming for a 14-minute pace. Those weekend runs got longer and longer and harder and harder, but it felt good to check off the mileage on my calendar. Crossing the finish line after 6.5 hours was one of the greatest moments of my life. Doing something that seems impossible is an incredible experience. I still set goals for myself, but they’re a bit different now. I lace up 6 days a week because consistency is important to me. I mostly run 5ks or 10ks, with three or four half marathons a year thrown in. Not long ago, I ran a 10k. It was brutally hot and humid. Around mile four, a guy who must have been 75 or 80 years old caught up with me. We were both struggling because of the heat, so we began to encourage each other to keep going. We ended up finishing the race together. My goal is to be like him, still running or walking every day years from now. For me, it’s not about being fast (I’m not), or winning my age group (I never do), but remaining healthy, enjoying the sport, and continuing to be a part of the running community that brings me so much joy. TS: How have the past 6 years of running affected your life and personality? SD: Physical activity was never an integral part of my life until I started walking, and then running, at age 56. I’m happier with myself now that I am active. I’ve learned that being outdoors at least 30 minutes a day helps me stay centered and keeps my spirit balanced. Running has also helped my husband and me explore Central Florida. He comes with me to every race to cheer me on. We’ve seen so many beautiful places because of all the races we’ve done -- parks we might never have known about, beaches, trails, rivers, forests, beautiful neighborhoods, urban areas. I’ve participated in races through Sea World, Universal, and all of the Disney parks. It’s amazing to see them at dawn without any other visitors. Track Shack Youth Foundation funds many youth initiatives. In addition, nearly every weekend of the year, there’s a race to benefit kids, veterans, medical research, national parks, homeless shelters, sea turtles, dogs, cats, you name it. It’s a way of giving back. TS: Do you run with a group, headphones, a friend? Do you have a certain time of the day that you run? SD: I enjoy running alone early in the morning, always on public streets with sidewalks (safety first). During my five-minute warm-up while I stretch and walk, I just enjoy the quiet and the stillness of the morning. Once I start moving faster, I listen to music or a podcast. I never leave home without water and identification. Also, having the right equipment is critical to healthy running or walking – including shoes, socks, wicking clothing, and the correct sports bra. I’m part of a wonderful women’s running club on Facebook, Seminole County Moms Run This Town (SCMRTT). We share information, motivate each other, meet up for group runs, and provide positive, caring support for each other. I’ve made so many friends through SCMRTT and the group is now a big part of my running life. I’m also a virtual participant in a running club in my North Carolina hometown. Collectively, the club members are on track to run the circumference of the earth TWICE, 48,802 miles, in 2018. I don’t think my mileage will put us over the top, but it’s fun to contribute to the effort. TS: How have you stayed motivated in these 6 years? Fanatic Series, because it commits you to fun, interesting races through the full running season. I’ve had a few injuries over the years that have sidelined me for a while, but I’ve been able to work through, recover, and return to running. Taking classes to help improve my running style has really helped, too. Tell us about how you balance work and health and your personal life. Finding harmony really is THE goal, right? Nobody succeeds at it all the time, but I believe we have to keep trying because life is an adventure. You have to leave your comfort zone. Get out there. Find a new path. Try something you secretly believe is impossible. It’s never too late to start.